WHAT is one of the uses of the law? In thus making known sin, and the consequent need of a Saviour, what part does the law act? What is the significance of the name bestowed by the angel upon the Saviour before His birth? “But we preach Christ crucified, unto the Jews a stumbling block, and unto the Greeks foolishness; but unto them which are called, both Jews and Greeks, Christ the power of God, and the wisdom of God.” 1 Cor. 1:23,24. What was foretold concerning Christ’s attitude toward the law of God? “Then said I, Lo, I come: in the volume of the book it is written of Me, I delight to do Thy will, O M y God: yea, Thy law is within My heart.” Psa. 40:7,8. What is the first promise of the new covenant? “For this is the covenant that I will make with the house of Israel after those days, saith the Lord; I will put My laws into their mind, and write them in their hearts.” Heb. 8:10. What is Christ’s relation to this new covenant? “But now hath He obtained a more excellent ministry, by how much also He is the mediator of a better covenant; which was established upon better promises.” Heb. 8:6. How is this same work for man otherwise described? “For every high priest is ordained to offer gifts and sacrifices: wherefore it is of necessity that this Man have somewhat also to offer. For if He were on earth, He should not be a priest, seeing that there are priests that offer gifts according to the law.” Heb. 8:3,4. What is necessary on the part of the individual in order to receive the benefit of Christ’s work? “With the heart man believeth unto righteousness; and with the mouth confession is made unto salvation.” Rom. 10:10. “Yea doubtless, and I count all things but loss for the excellency of the knowledge of Christ Jesus my Lord: for whom I have suffered the loss of all things, and do count them but dung, that I may win Christ, and be found in Him, not having mine own righteousness, which is of the law, but that which is through the faith of Christ, the righteousness which is of God by faith.” Phil. 3:8,9. What relation does the law sustain to this righteousness? “But now the righteousness of God without the law is manifested, being witnessed by the law and the prophets.” Rom. 3:21. Does the faith which brings righteousness abolish the law? NOTE.-The law reveals the perfection of character required, and so gives a knowledge of sin; but it is powerless to confer the character demanded. In the gospel, the law, first written in the heart of Christ, becomes “the law of the Spirit of life in Christ Jesus,” and is thus transferred to the heart of the believer, in whose heart Christ dwells by faith. Thus the new covenant promise is fulfilled that the law shall be written in the heart. This is the genuine experience of righteousness by faith,- a righteousness which is witnessed by the law, and revealed in the life in harmony with the law. The gospel is thus seen to be the provision for restoring the law to its place in the heart and life of the one who believes on Christ, and accepts His mediatorial work. Such faith, instead of making void the law, establishes it in the heart of the believer. The gospel is not against the law, therefore, but upholds, maintains, and presents the law to us in Christ. “The next day John seeth Jesus coming unto him, and saith, Behold the Lamb of God, which taketh away the sin of the world.” John 1:29. “But is now made manifest by the appearing of our Saviour Jesus Christ, who hath abolished death, and hath brought life and immortality to light through the gospel.” 2 Tim. 1:10. “But we all, with open face beholding as in a glass the glory of the Lord, are changed into the same image from glory to glory, even as by the Spirit of the Lord.” 2 Cor. 3:18. See note on question 17 of Conversion or the New Birth Study. NOTE.-It is sometimes claimed that Christ changed, abolished, or took away the law, and put the gospel in its place; but this shows a misapprehension of the real work of Christ. The individual believer is changed by beholding the glory revealed in the gospel (2 Cor. 4:4; John 1:14); death has been abolished through the death of Christ; and sin has been taken away by the great Sin-bearer; but the law of God still remains unchanged as the very foundation of His throne. What spiritual interpretation did Christ give to the sixth commandment? “Ye have heard that it was said by them of old time, Thou shalt not kill; and whosoever shall kill shall be in danger of the judgment: but I say unto you, That whosoever is angry with his brother without a cause shall be in danger of the judgment: and whosoever shall say to his brother, Raca, shall be in danger of the council: but whosoever shall say, Thou fool, shall be in danger of hell-fire.” Matt. 5:21,22. How did He interpret the seventh commandment? “Ye have heard that it was said by them of old time, Thou shalt not commit adultery: but I say unto you, That whosoever looketh on a woman to lust after her hath committed adultery with her already in his heart.” Matt. 5:27,28. NOTE.-Christ not only gave a spiritual interpretation to the law and Himself observed it according to that interpretation, but He showed the holiness and the immutable nature of the law by dying on the cross to pay the penalty of its transgression. In this way, above all He magnified the law, and showed its far-reaching, immutable, and imperishable nature. heathen through faith, preached before the gospel unto Abraham, saying, In thee shall all nations be blessed.” Gal. 3:8. In what way are all believers in Jesus justified? After this work of grace has been accomplished, is the believer expected to go on in sin? “What shall we say then? Shall we continue in sin, that grace may abound? God forbid. How shall we, that are dead to sin, live any longer therein?” Rom. 6:1,2. NOTE.-Even in the days of Abraham the same gospel of righteousness by faith was preached as now, while the law made known sin, and witnessed to the righteousness obtained through faith, just as it has done since the cross. From this it is evident that the relation between the law and the gospel has always been the same. What was Christ’s personal attitude toward the law? “Think not that I am come to destroy the law, or the prophets: I am not come to destroy, but to fulfil.” Matt. 5:17. “If ye keep My commandments, ye shall abide in My love; even as I have kept My Father’s commandments, and abide in His love.” John 15:10. 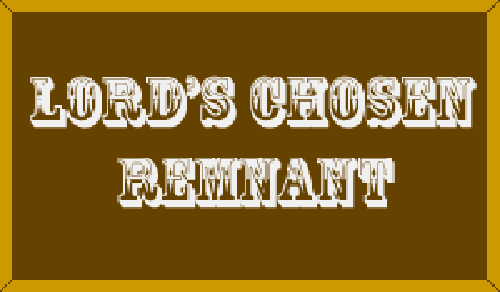 What scripture shows that God’s remnant people will have a right conception of the proper relation between the law and the gospel?